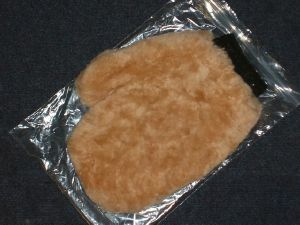 This sheepskin washmitt is manufactured from exactly the same skins as the thumbless mitt. This 'thumbed' version of the mitt manufactured from genuine premium Merino lambswool skins so not only is it soft but durable as well. Nothing is as gentle on your car's finish as natural sheepskin. These ultra-soft wash mitts have a deep, plush pile that will pamper your car's finish with loads of soapy water. We highly recommend this a safe effective way to wash your vehicle. Note: You must thoroughly rinse your sheepskin wash mitt with clean, cool water after each use and allow to air dry. With care, your natural sheepskin mitt will last a full year or longer. If you machine wash, use gentle wash cycle and dry on low.